The real problem with mystical, underground cults (in our experience, anyway) is always the dress code. You're never sure what they want you to wear. Because the membership pamphlets are always vague when it comes to wardrobe, with weird instructions like "dress in a sinister and mysterious manner" or "ceremonial garb of yore required." Great, but what does that actually mean?! Have no fear. Your kid's first outing with the local ghouls will go perfectly when she shows up wearing this spooky Child Red Hooded Robe! But how does it conform to the standards of the local blood cult? you might ask. First, this deceptively simple costume nails the "sinister and mysterious" part perfectly. The two tones are a deep black and a dark "brick" red, which has the slightly darkened hue of blood! Because you can't do evil dressed in baby blue. But perhaps the most important part is the hood, which shows just enough of her face to strike doubt into the hearts of mankind. Is she human? Is she a ghost? Will she take our candy by force if we don't hand it over willingly? They won't know. As for the "ceremonial garb of yore" part, this robe isn't just a dark sheet you throw on. With its long, hanging sleeves and laced inset at the front, it looks like something right out of a medieval witches' coven! This robe is ready to wear as a great costume right out of the box, or it goes great with makeup, and suits any scary fantasy! 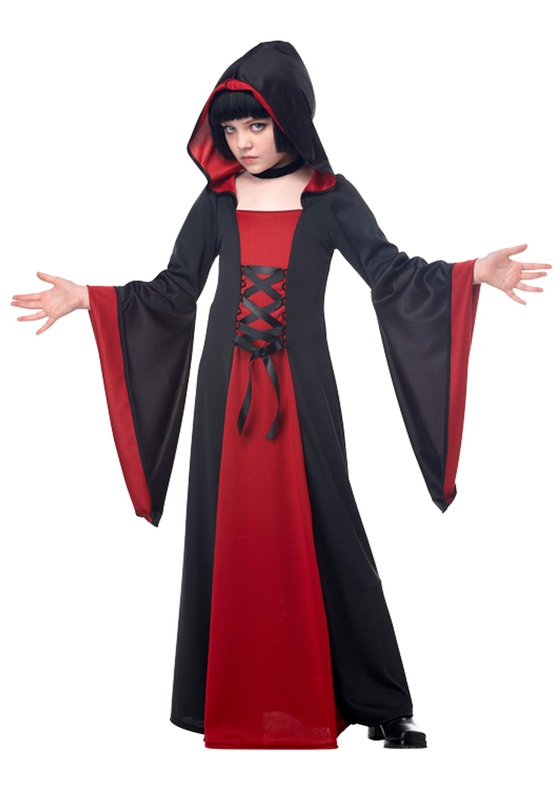 Whether it's a witch, sorceress, vampire, she-devil, you name it, your kid will be up to the task in the Child Red Hooded Robe!